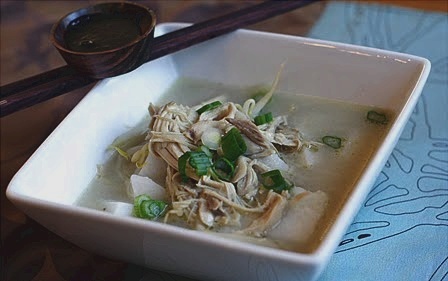 Soto ayam is a yellow spicy chicken soup with vermicelli, commonly found in Indonesia, Singapore and Malaysia. Turmeric is added as one of its ingredients to get yellow chicken broth. Besides chicken and vermicelli, it is also served with hard-boiled eggs, slices of fried potatoes, Chinese celery leaves, and fried shallots. Sometimes, slices of Lontong (compressed rice roll) are also added. Occasionally, people will add "koya", a powder of mixed fried garlic with prawn crackers or bitter Sambal (orange colored). Krupuk are a very common topping. Soto Ambengan, originated from Ambengan, Surabaya. 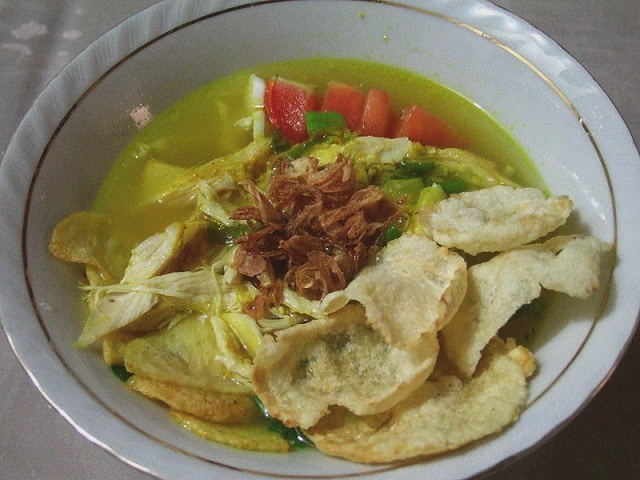 Soto Ambengan is famous for its delicious koya topping. Grind onion, lemon grass, garlic and ginger in the blender. In a pot, heat the oil and add the 4-spices until fragrant. Add in the grounded ingredients and stir until fragrant. Add water and chicken, let it boil. About 30 min. Take the chicken out and let them cool. Add coconut milk into the pot together with salt and sugar to taste. If necessary, add another cup of water. In the meantime, shred the meat of the chicken and add them back into the pot together with the bones. Let it boil for another 15-20min. Serve hot with rice cakes/nasi impit (cut into bite-sized cubes) or vermicelli and bean sprouts. Although bawang merah translates to red onion, what you want to use are shallots.